NK MACS Medium is the perfect solution for NK cell culture and expansion from peripheral blood mononuclear cells (PBMCs) or isolated NK cells. The chemically defined, xeno-free composition ensures reproducible results. Expanded NK cells are fully functional and can be used in any downstream application, e.g., killing assays. When starting the expansion from PBMCs, growth and expansion of unwanted cells (T cells, NKT cells) is minimal. Superior expansion of NK cells in NK MACS Medium compared to standard culture methods. NK cells can be expanded using PBMCs or NK cells isolated from whole blood, buffy coat or PBMCs as starting material. 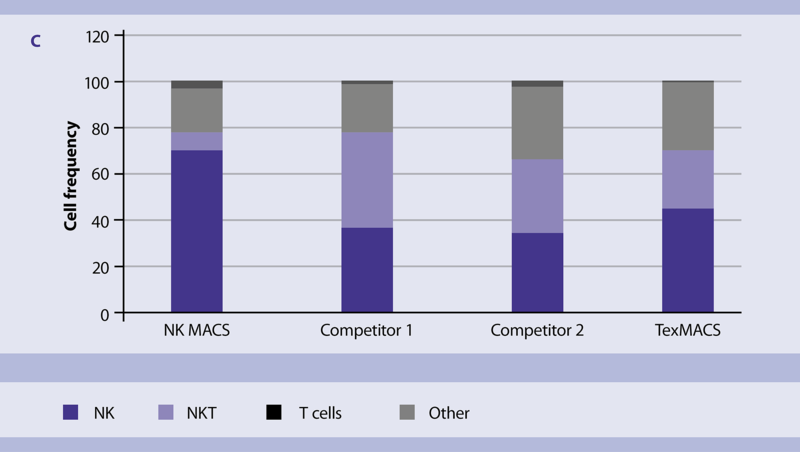 Using NK MACS® Medium results in three-fold higher NK cell expansion compared to a competitor medium or TexMACS™ Medium (T cell medium). 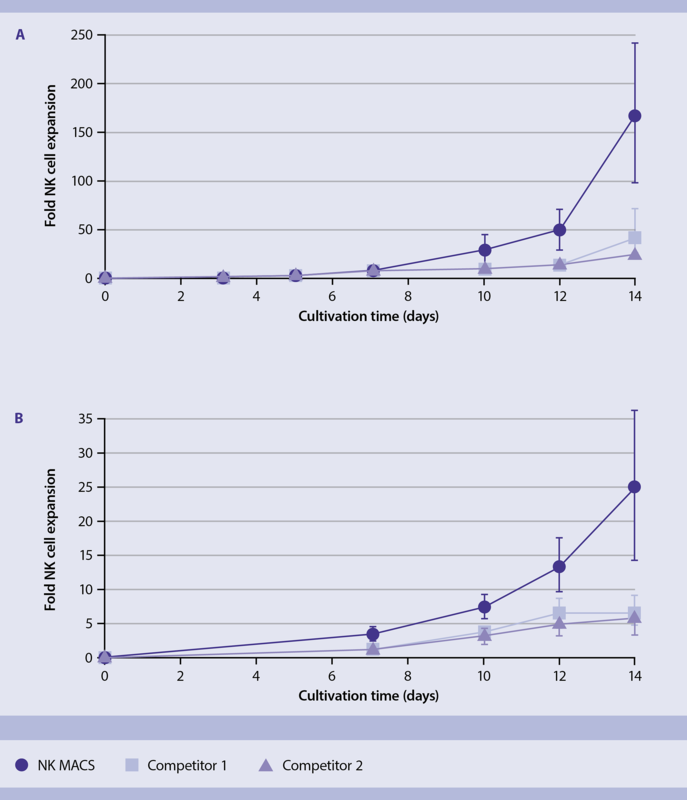 Superior expansion of NK cells in NK MACS Medium compared to standard culture methods. NK cell expansion from (A) PBMCs (n=3) or (B) isolated NK cells (n=3) using 5% AB serum and 500 IU/mL of IL-2 showed a higher fol expansion using NK MACS Medium. NK MACS Medium favors NK cell growth and limits the growth of unwanted cells. When PBMCs are used as starting material, NK MACS Medium favors NK cell growth compared to competitor mediums or TexMACS (T cell medium). Its defined composition limits growth of unwanted T, NKT, B and DC cells. NK MACS Medium favors NK cell growth and limits the growth of unwanted cells. Cell composition after 14 days of PBMC expansion in different standard culture media. NK cells (CD3-CD56+), T cells (CD3+), NKT cells (CD3+CD56+) and other cells (CD3-CD56-).